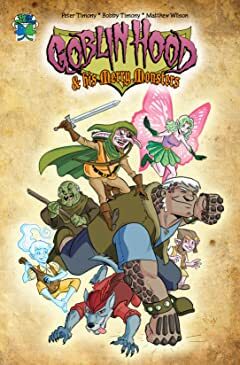 Mix equal parts Robin Hood, monsters and faerie folklore and you get this fantastical update on a timeless tale. 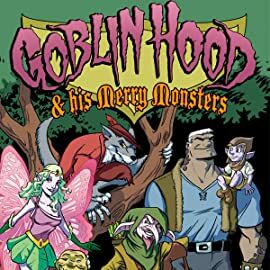 Transformed into a goblin and framed for murder, Robin Goodfellow becomes Goblin Hood and seeks to clear his good name and bring justice to the oppressed people of KnottyElm. Joining him in his battle are his faithful companions such as Little Giant, Friar Muck, Spill Scarlet, and Fey Faerion. 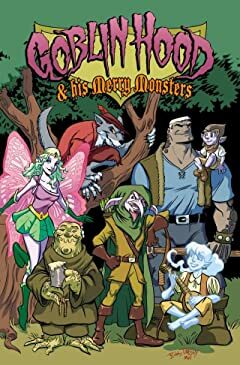 Together they match wits with the Sheriff (a troll transformed into an elf), his monstrous guards and the wicked Prince Faun.